Simple Tips to Prep for the Holidays - Columbia Builders, Inc. If you haven’t started prepping for the holidays, including Thanksgiving next week, now is the time to get on it with these tips! Taking the time now to make simple preparations for the upcoming holiday season will ensure more joy and less stress as you celebrate! With Thanksgiving right around the corner, now is the time to accomplish as much as you can by planning ahead. Having a good calendar on hand – either electronic or old school paper and pen – is essential to organize travel plans, events, as well as festivities you will be hosting or attending. Take stock of your home as well – here are a few tips to keep you on track and prepared for the holidays. Before you fill your home with guests, take on any home repair projects that you’ve previously tabled. Whether you spend a few nights or a weekend, or hire a professional, this is one instance where an ounce of prevention is worth a pound of cure! You will demand more from your home’s systems during the holidays – from your heating and plumbing components down to your appliances – so have everything serviced and in good repair. If you’ll be hosting a get together make sure you have what you need well in advance. From place settings and glassware to serving pieces and table linens – as well as cookware, bakeware, and specialty utensils – taking inventory now allows time to either purchase or borrow what you need. If friends or family are staying with you, extend your inventory count to towels, sheets, blankets and pillows. If any of these items have seen better days, replace them. Whether you watch for sales or visit your local warehouse store, stock up on cleaning supplies and paper products. 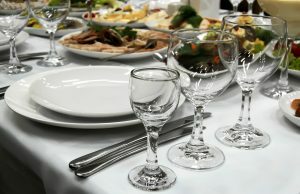 If you’ll be hosting one or more gatherings, plan the menu and assemble a master list of ingredients from your recipes. It will be easier now to track down that one specialty item, and stock up on kitchen basics. Lastly, from ice melt to firewood, be sure to have enough winter essentials on hand to get you through the holidays. Whatever space you will utilize – a dedicated guest suite or a multi-purpose space – there are several things you can do in advance of receiving your guests to make them feel welcomed and cared for in your home. Friends or family staying with you should be provided a lamp with ample reading light, a clock, comfortable pillows, extra blankets, towels and toiletries, and a space for their belongings (including a hanging space with hangers). Items such as fresh flowers, seasonal décor, reading materials, and bottled water add a pampering touch! This entry was posted on Friday, November 16th, 2018 at 10:39 am. Both comments and pings are currently closed.